The emotional-reactivity hypothesis proposes that problem-solving abilities can be constrained by temperament, within and across species. One way to test this hypothesis is with the predictions of the Yerkes–Dodson law. The law posits that arousal level, a component of temperament, affects problem solving in an inverted U-shaped relationship: Optimal performance is reached at intermediate levels of arousal and impeded by high and low levels. 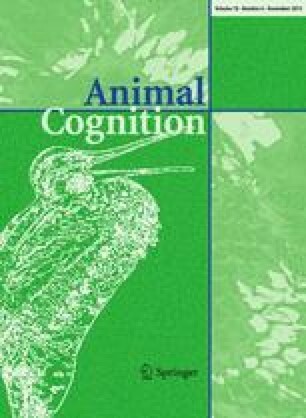 Thus, a powerful test of the emotional-reactivity hypothesis is to compare cognitive performance in dog populations that have been bred and trained based in part on their arousal levels. We therefore compared a group of pet dogs to a group of assistance dogs bred and trained for low arousal (N = 106) on a task of inhibitory control involving a detour response. Consistent with the Yerkes–Dodson law, assistance dogs, which began the test with lower levels of baseline arousal, showed improvements when arousal was artificially increased. In contrast, pet dogs, which began the test with higher levels of baseline arousal, were negatively affected when their arousal was increased. Furthermore, the dogs’ baseline levels of arousal, as measured in their rate of tail wagging, differed by population in the expected directions. Low-arousal assistance dogs showed the most inhibition in a detour task when humans eagerly encouraged them, while more highly aroused pet dogs performed worst on the same task with strong encouragement. Our findings support the hypothesis that selection on temperament can have important implications for cognitive performance. The online version of this article (doi: 10.1007/s10071-015-0901-1) contains supplementary material, which is available to authorized users. Thanks to R. Seyfarth, D. Cheney, J. Serpell, A. Duckworth, and two anonymous reviewers for valuable feedback on drafts and statistical analysis, as well as A. Gersick, I. Schamberg, and N. Snyder-Mackler for thoughtful discussion. We also thank K. Morucci and L. Lewis for help with coding, along with K. Duffy, E. Blumstein, T. Jones, A. Reinhardt, L. Thielke, L. Strassberg, M. Jackson, C. Wang, and members of the Duke Canine Cognition Center for assistance with data collection and testing. We are extremely grateful to the administration, trainers, and staff at Canine Companions for Independence, and especially Paul Mundell, former National Director of Canine Programs and current Chief Executive Officer, for allowing us to work with their dogs and use their state-of-the-art facilities. This work was supported in part by the Vertical Integration Program, the Duke Undergraduate Research Support Office, the AKC Canine Health Foundation, a National Science Foundation Graduate Research Fellowship under Grant No. DGE-1321851, Office of Naval Research Grant No. NOOO14-12-1-0095, and National Institute of Health Grant 5 R03 HD070649-02. Any opinions, findings, and conclusions or recommendations expressed in this material are solely the responsibility of the authors and do not necessarily reflect the views of the National Science Foundation or the AKC Canine Health Foundation. The study was funded by the AKC Canine Health Foundation, the National Science Foundation (Grant No. DGE-1321851), the Office of Naval Research (Grant No. NOOO14-12-1-0095), and the National Institute of Health (Grant No. 5 R03 HD070649-02). All applicable international, national, and/or institutional guidelines for the care and use of animals were followed. All procedures performed in studies involving animals were in accordance with the ethical standards of the institution or practice at which the studies were conducted.